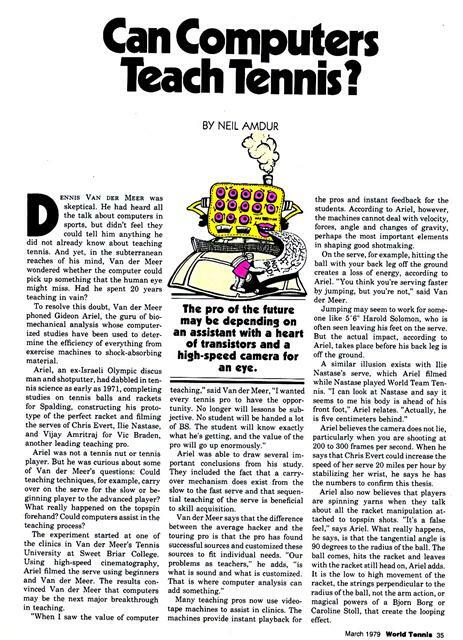 The pro of the future may be depending on an assistant with a heart of transistors and a high-speed camera for an eye. DENNIS VAN DER MEER was skeptical. He had heard all the talk about computers in sports, but didn't feel they could tell him anything he did not already know about teaching tennis. And yet, in the subterranean reaches of his mind, Van der Meer wondered whether the computer could pick up something that the human eye might miss. Had he spent 20 years teaching in vain? To resolve this doubt, Van der Meer phoned Gideon Ariel, the guru of biomechanical analysis whose computerized studies have been used to determine the efficiency of everything from exercise machines to shock-absorbing material. Ariel, an ex-Israeli Olympic discus man and shotputter, had dabbled in tennis science as early as 1971, completing studies on tennis balls and rackets for Spalding, constructing his prototype of the perfect racket and filming the serves of Chris Evert, Ilie Nastase, and Vijay Amritraj for Vic Braden, another leading teaching pro. Ariel was not a tennis nut or tennis player. But he was curious about some of Van der Meer's questions: Could teaching techniques, for example, carry over on the serve for the slow or beginning player to the advanced player? What really happened on the topspin forehand? Could computers assist in the teaching process? The experiment started at one of the clinics in Van der Meer's Tennis University at Sweet Briar College. Using high-speed cinematography, Ariel filmed the serve using beginners and Van der Meer. The results convinced Van der Meer that computers may be the next major breakthrough in teaching. "When I saw the value of computer teaching," said Van der Meer, "I wanted every tennis pro to have the opportunity. No longer will lessons be subjective. No student will be handed a lot of BS. The student will know exactly what he's getting, and the value of the pro will go up enormously." Ariel was able to draw several important conclusions from his study. They included the fact that a carryover mechanism does exist from the slow to the fast serve and that sequential teaching of the serve is beneficial to skill acquisition. Van der Meer says that the difference between the average hacker and the touring pro is that the pro has found successful sources and customized these sources to fit individual needs. "Our problems as teachers," he adds, "is what is sound and what is customized. That is where computer analysis can add something." Many teaching pros now use videotape machines to assist in clinics. The machines provide instant playback for the pros and instant feedback for the students. According to Ariel, however, the machines cannot deal with velocity, forces, angle and changes of gravity, perhaps the most important elements in shaping good shotmaking. On the serve, for example, hitting the ball with your back leg off the ground creates a loss of energy, according to Ariel. "You think you're serving faster by jumping, but you're not," said Van der Meer. Jumping may seem to work for someone like 5'6" Harold Solomon, who is often seen leaving his feet on the serve. But the actual impact, according to Ariel, takes place before his back leg is off the ground. A similar illusion exists with Ilie Nastase's serve, which Ariel filmed while Nastase played World Team Tennis. 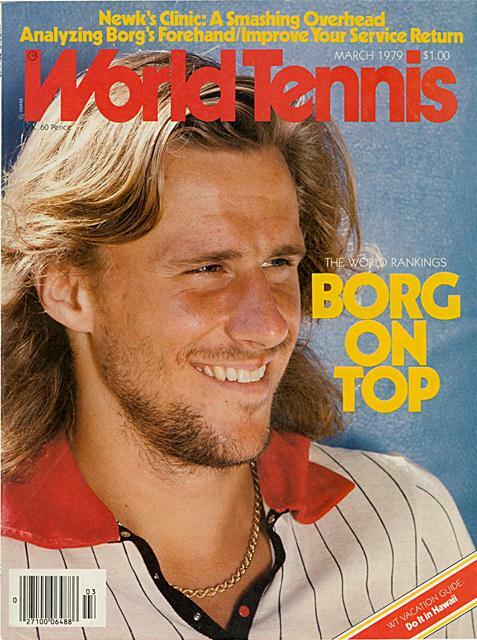 "I can look at Nastase and say it seems to me his body is ahead of his front foot," Ariel relates. "Actually, he is five centimeters behind." Ariel believes the camera does not lie, particularly when you are shooting at 200 to 300 frames per second. When he says that Chris Evert could increase the speed of her serve 20 miles per hour by stabilizing her wrist, he says he has the numbers to confirm this thesis. Ariel also now believes that players are spinning yarns when they talk about all the racket manipulation attached to topspin shots. "It's a false feel," says Ariel. What really happens, he says, is that the tangential angle is 90 degrees to the radius of the ball. The ball comes, hits the racket and leaves with the racket still head on, Ariel adds. It is the low to high movement of the racket, the strings perpendicular to the radius of the ball, not the arm action, or magical powers of a Bjorn Borg or Caroline Stoll, that create the looping effect. The computer breaks down a beginner's serve into a sequence of stick figures. By comparing a student's stroke with that of a "model" stroke, a teaching pro can make corrections. 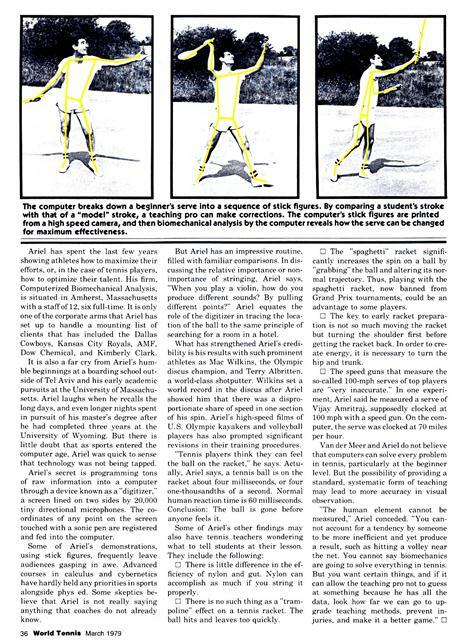 The computer's stick figures are printed from a high speed camera, and then biomechanical analysis by the computer reveals how the serve can be changed for maximum effectiveness. Ariel has spent the last few years showing athletes how to maximize their efforts, or, in the case of tennis players, how to optimize their talent. His firm. Computerized Biomechanical Analysis, is situated in Amherst, Massachusetts with a staff of 12, six full-time. It is only one of the corporate arms that Ariel has set up to handle a mounting list of clients that has included the Dallas Cowboys. Kansas City Kovals, AMF, Dow Chemical, and Kimberly Clark. It is also a far cry from Ariel's humble beginnings at a boarding school outside of Tel Aviv and his early academic pursuits at the University of Massachusetts. Ariel laughs when he recalls the long days, and even longer nights spent in pursuit of his master's degree after he had completed three years at the University of Wyoming. But there is little doubt that as sports entered the computer age, Ariel was quick to sense that technology was not being tapped. Ariel's secret is programming tons of raw information into a computer through a device known as a "digitizer,' a screen lined on two sides by 20,000 tiny directional microphones. The coordinates of any point on the screen touched with a sonic pen are registered and fed into the computer. Some of Ariel's demonstrations, using stick figures, frequently leave audiences gasping in awe. Advanced courses in calculus and cybernetics have hardly held any priorities in sports alongside phvs ed. Some skeptics believe that Ariel is not really saying anything that coaches do not already know. But Ariel has an impressive routine. filled with familiar comparisons. In discussing the relative importance or nonimportance of stringing, Ariel says. "When you play a violin, how do you produce different sounds? By pulling different points?" Ariel equates the role of the digitizer in tracing the location of the ball to the same principle of searching for a room in a hotel. What has strengthened Ariel's credibility is his results with such prominent athletes as Mac Wilkins, the Olympic discus champion, and Terry Albritten. a world-class shotputter. Wilkins set a world record in the discus after Ariel showed him that there was a disproportionate share of speed in one section of his spin. Arielï¿½s high-speed films of U.S. Olympic kayakers and volleyball players has also prompted significant revisions in their training procedures. "Tennis players think they can feel the ball on the racket." he says. Actually, Ariel says, a tennis ball is on the racket about four milliseconds, or four one-thousandths of a second. Normal human reaction time is 60 milliseconds. Conclusion: The ball is gone before anyone feels it. 11 There is little difference in the efficiency of nylon and gut. Nylon can accomplish as much if you string it properly. O There is no such thing as a "trampoline" effect on a tennis racket. The ball hits and leaves too quickly. E The "spaghetti" racket significantly increases the spin on a ball by "grabbing" the ball and altering its normal trajectory. Thus, playing with the spaghetti racket, now banned from Grand Prix tournaments, could be an advantage to some players. 11 The key to early racket preparation is not so much moving the racket but turning the shoulder first before getting the racket hack. In order to create energy, it is necessary to turn the hip and trunk. Li The speed guns that measure the so-called 100-mph serves of top players are "very inaccurate," In one experiment. Ariel said he measured a serve of Vijay Amritraj. supposedly clocked at 100 mph with a speed gun. On the computer, the serve was clocked at 70 miles per hour. Van der :Veer and Ariel do not believe that computers can solve every problem in tennis, particularly at the beginner level. But the possibility of providing a standard, systematic form of teaching may lead to more accuracy in visual observation. Generated on 4/22/2019 5:08:33 PM (PST) ADI/HQ/GBA/2019/ARIELCLOUD/v3.0.2018.0126.